As kids, one of our favorite Sunday desserts was pecan pie. It seemed like Mama made one almost every Sunday, too. That was the day when we always had even more dinner guests than usual. You see, people tended to gravitate towards our house at meal time (Mama has always made amazing meals) and my parents had a policy of never turning anyone away at suppertime. Over the years, we ended up “adopting” various bachelor uncles here and there who would show up every Sunday, many of them every weeknight as well. My brother had two friends, brothers, who were invited for dinner one night and literally ate every single night after that (unless they had dates) for the next three years. Mama said she never minded, she always hoped that someone would do the same for one of her kids. Have you ever made pecan soup? Want to make the PERFECT pecan pie? You’ll need: eggs, sugar, white corn syrup, margarine, pecans, an unbaked pie shell. One of my reader’s made this pie using my mix in pan pie and said it was fabulous! In medium bowl, beat eggs well. Blend in sugar with whisk. Pour entire contents into pie shell. Place in COLD oven. Turn oven to 300 degrees and bake for one hour. In a medium bowl, beat eggs. Blend in the sugar. Stir in remaining ingredients, mixing well. Pour in pie shell and place in cold oven. Turn oven to 300 degrees. Bake 1 hour. Mama says “This is the best pecan pie I have found. Guaranteed not to turn to pecan soup”. 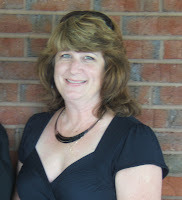 Friends, I’d like to introduce you to a dear friend, Terri. Terri and I got to know each other early on in my Southern Plate days when she sent me her recipe for Dixie Cornbread. Just as it was with all of you, I felt an instant kinship to this Magnolia who had been transplanted to the big apple. We’ve kept in close touch via email, telephone, and my mother and myself are going to meet her in the spring where she has invited us for a weekend in “the big city”. As Southern Plate has grown, one of the things that I miss most is being able to personally email each one of you and respond to every email I receive. I read them each day as they come in and they just mean so much to me. I have an entire stack of emails printed out that I am saving, that is how special they are! Your feedback and emails mean so very much and keep me so excited about Southern Plate! It has been really bothering me though, that I haven’t had time to email every one back personally because I feel like if you take the time out of your busy day to email me, the least I can do is email back and I do want you to know how much I appreciate each and every one of you. This is where Terri earns her wings. She has volunteered to help me with my communications by sorting through emails, answering what she can, and forwarding on those that need to go to Mama or myself. I will still be reading every single email but now instead of fretting over not having time to email back, you will each get a response from either myself, my mother, or Terri. This is going to help you get responses to important questions faster and also let you know that your email did get through and was read in a much more timely manner. Most importantly, its going to be a much more neighborly way of doing things. Basically, our front porch is getting big and we want to expand it so folks have more time to sit, relax, and visit with us. I just have another friend whose gonna be walkin’ around making sure your tea glass is filled and handing out Mama Reed’s Teacakes to everyone so you can get your sugar rush before you have to go back out into the world again. I hope y’all are having a great week and I also hope this pie makes it on a few tables this Thanksgiving! Southern Plate Celebrates 100 Recipes With Link Love! I left out the dixie cornbread link!!! So do you guys pronounce it “PE-CAN” or “PE-CON”? It’s always been a big debate between my aunt from Texas and my Washingtonian mom! One of my college friends from Decatur, Alabama, said it was Pe-con becase a pee-can was what her grandma kept under the bed at night. Pe-con!!! Is the way we pronounce here in Mississippi!! Umm That Pe-Can Pie Looks awesome. I love the lolipop turkey that is just to precious. I will be in charge of bringing a pie for thanksgiving so i might make your pecan pie. My MIL will love it. I always take Chocolate Pecan Pie which i love dearly so i will have to see. Looks awesome! My whole family loves Pecan Pie. I just received a pound of pecans from Oh! Nuts and I’m planning to make a pecan pie myself! I’ll have to try this recipe. I have 2 really good recipes for Pe-Con pie but one has you cook a syrup first that has to cool before you add the other ingredients. The other has you brown the butter (and cool it). Your recipe looks much easier with no waiting for things to cool. I’m all for easy if it’s good! OMGosh! Are you SURE we weren’t raised in the same place??? My mama used to make “Pecan Soup” that was supposed to be pecan pie too. LOL. I’m going to have to pass this one on to her. Thanks! I can not wait to try this! I love pecan pie. But that aside, where did you find that adorable turkey lolly holder? That is so cute. hehe! Its all in good fun though! Hey Honey B! Goodness, I have to get my candied pecan recipe up soon now! I wish I had a place to get them. I have to buy them and I pay an arm and a leg, I swear! Pam You know, I just don’t think a pecan pie is capable of tasting bad, even when its soup! LOL I’m like you though, give me easy any day! Kingsqueen HOW FUNNY!!!!! LOL I bet she’ll be as relieved to get this as my mama was! LOL We MUST be related!! You do kinda favor my daddy’s side…. Hope y’all are having a great day!!!!!!!!!!!!!!! Hey, my mamma says the same thing- “a PEE-can is something that’s under the seat in the car on road trips…” haha. Down south the accent is on the second syllable, not the first syllable. puh -CAWN. That’s why is sounds so strange when Yankees say it. Messeis Hey! Mama said she got that at the Nashville Flea Market. She said they have it at just about all of the craft fairs this time of year and the grandkids just love it! Christy….I love the pie, but I really want that turkey with the lollipops! 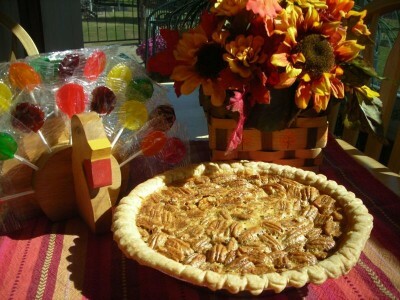 Pecan Pie was always one of my Thanksgiving favorites – right next to the chocolate cream pies. As I’ve gotten older, I’ve developed a taste for the double-crust fruit pies as well, but pecan will always hold a special place for me – right in the middle of my plate! This pie looks amazing Christy! Great Job. I am a huge fan of pecan pie. Would you mind sending me down a piece. My grandmother made the best pecan pie but she passed away a couple of years ago. Last, Thanksgiving was our first without her and I requested to be given the task of making the pecan pie. In a Southern kitchen, I took that as a great honor! This pie looks wonderful. I am making this pie soon! Probably this weekend. It looks SO simple and easy. Does anyone else know what a “low country boil” is? I haven’t had one in years, and my husband showed me a link today, didn’t realize that’s what it was! And being the pregnant woman I am, I WANT ONE!! I can’t wait to find a big enough pot. The last low country boil I attended was back in my dating days. They lined the tables with newspaper and went down pouring out buckets of potatoes, corn, and crawdads in the center of the table. I don’t eat seafood and was somewhat ….umm…yeah…then my date ate enough crawdads to have ten heads, which he put on each of his fingers and chased me around the table with. We do have them though! Don’t worry about a big enough pot, just make a smaller quantity! I love this. Sooo – how about I made pecan flour and coated some porkchops with them before I deep fried them…the pics are on my blog – lol! I didn’t make a silly mistake the first time. Any suggestions? Thanks for your hard work. Love your site! Thanks Christy, I will have to make this for my son but without the pecans, he doesn’t like nuts. But, he loves the filling. Christina The pecans in this kind of float to the top. However, if you were to put more they would be throughout the pie a bit! This pie is just wonderful, though! Anonymous LOL Well I am so sorry to disappoint but thanks for taking the time to comment (and give me a giggle!). Belle Hey!! Did you put them in the oven at the same time? That would account for a longer cooking time than usual. Other than that, you might want to get a little oven thermometer. You can get them for a few dollars and they just hang on your oven rack. I put one in my oven at least once a year to see if I am still baking at the right temperature. Its amazing how off those ovens can get! Half an hour more is not that much difference though, could be just doing two at a time. I am sorry for the extra trouble! Thank you for letting me know! You know, it could have been planetary alignment or pecan gods too…. hehe! Audrey you need to get with Christina’s Dad a few comments back, he wants more pecans and less filling!!!! I hope y’all are all having a wonderful day!! OK its Thanksgiving and I am back at your site….after 1 hour of delicious distractions I am finally looking at the recipe I came for…Oh my…..I want to make the muffin mix…the carmelcorn…the fruit salad….but must focus and leave for now…its so hard….and make a pie….oh 1 more look around…. This pie was great! I made it for Thanksgiving and it was the first one gone. It sets up beautifully and looks wonderful from the minute you take it out of the oven. And, it’s delicious besides. HELP Christy! I tried to make this Pe-Can pie (LOL), not having ever attempted it before and it DID come out soupy!! What in the world did I do wrong? I followed everything you said to do……still came out delicious but still Pe-Can soup! Tonight I tried to make it again, and the same thing happened. Now when you take it out of the oven, is it supposed to be soupy and then as it cools it sets up??? How long until that happens? Or should it already be firm when you take it out after an hour? I would LOVE to be able to make it properly, got any suggestions for me? My mama makes this very pie! But…she uses dark corn syrup. We only get them during the holidays and look forward to them every year!!! Just isn’t the holidays without her pecan pies!!! This is a good basic pecan recipe. Years ago I was making pecan pies and didn’t have enough Light Karo, so I added honey. Family loved it and I have been adding honey ever since. Thank you Christy!! I followed your directions to a tee and it came out perfect. The only thing is I made a mistake and left it in the oven for 2 hours, I know crazy right…I completely forgot about it since I was cooking dinner, I’m surprised it didn’t burn, lol. Love your website, you rock lady! Hey Christy, made your mama’s no soupy pecan pie today…just doing a practice run for a church fall harvest Nov. 1 and wanted to make sure it was a good recipe…I was so tempted to add vanilla but didnt, followed it right to a tee. It’s beautiful, had to take out 5 min. early, it was getting too dark but its firm…thats what i wanted cause i’m gonna be making a bunch…Thanks for the recipe. I just put my first pecan pie in oven. I can’t wait until hour is up. Then I have to wait another one for pie to cool. let ya know how it was later thanks.